Dynamics 365 AI for Sales capabilities for seller requires Dynamics 365 for Sales 9.1.0.35 and above. Support for higher versions will be available in our future releases. The feature Who knows who and exchange data for Relationship analytics are available only in North American (NAM) regions. To know about Dynamics 365 AI for Sales related General Data Protection Regulation (GDPR), see Dynamics 365 AI for Sales and GDPR. You must purchase Dynamics 365 AI for Sales license to use Dynamics 365 AI for Sales features. You must be a Dynamics 365 for Sales administrator. Exchange email server is configured, and mailbox is enabled using Email Configurations in Settings. More information: System Settings dialog box - Email tab. 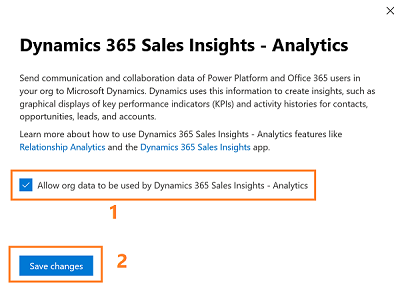 If you want to use LinkedIn data for Relationship analytics, verify that LinkedIn solution is installed in Dynamics 365 for Sales and write back from LinkedIn Sales navigator is enabled. On the AI setup page, select Get it now. On the Sales Insights installation page, carefully read and select the terms and conditions, and then select Continue. The installation takes a few minutes to complete, and then the status appears in the status bar. Status of installation is displayed. When complete, you're ready to configure Dynamics 365 AI for Sales features. Go to Settings > Setup AI. On the Overview tab, select Configuration from Relationship analytics section. You can also select Relationship analytics tab. Read and accept the Relationship analytics terms and conditions, and then select Begin Setup. On the Relationship analytics page, configure the parameters as described in the following table. 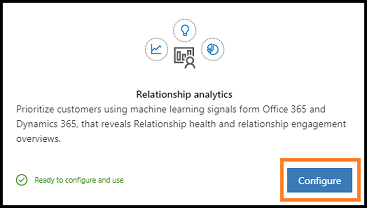 Data Sources CRM Activities: If enabled, all historical data from Dynamics 365 for Sales is ingested for computation in Relationship analytics. LinkedIn: If enabled, the data from LinkedIn will be ingested for KPI and health computation. by default, the option is enabled when LinkedIn is installed in Dynamics 365 for Sales. Note: This option is not available if LinkedIn is not installed in Dynamics 365 for Sales. Exchange Data: If enabled, 30 days of data from Exchange is ingested for KPI and health computation. Exchange connector ingests three days of data per day until the last 30 days of data is complete. Relationship Health Score Businesses place different emphasis on the type of communication used with customers. You can modify the importance of activities of different types as they contribute to the relationship health score. Communications Frequency Businesses have varying sales cycles and different expected levels of communications with customers. A longer expected communications frequency reduces the expectation of more recent frequent communications in the health score. A shorter expected communications frequency increases the expectation of more recent frequent communications in the health score. Relationship analytics is configured and ready to use in your organization. Enable Dynamics 365 AI for Sales – Analytics option in admin center to collect valuable information regarding communications, such as emails and meetings for users in your organization from Exchange server. This data is used in analytics features for salespeople and sales managers. When you enable this, the Exchange Data option on relationship analytics configuration page is automatically selected. 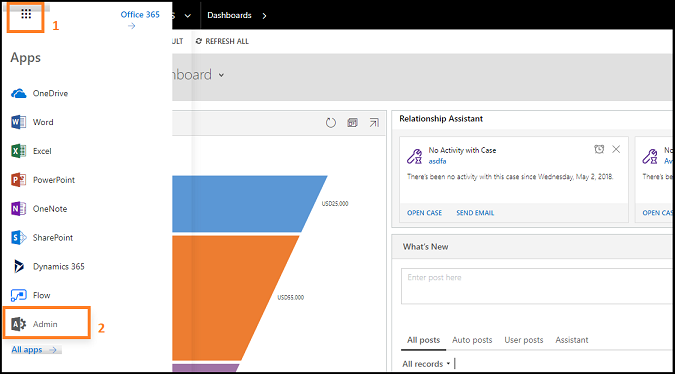 Select Settings > Services & add-ins > Dynamics 365 AI for Sales – Analytics. 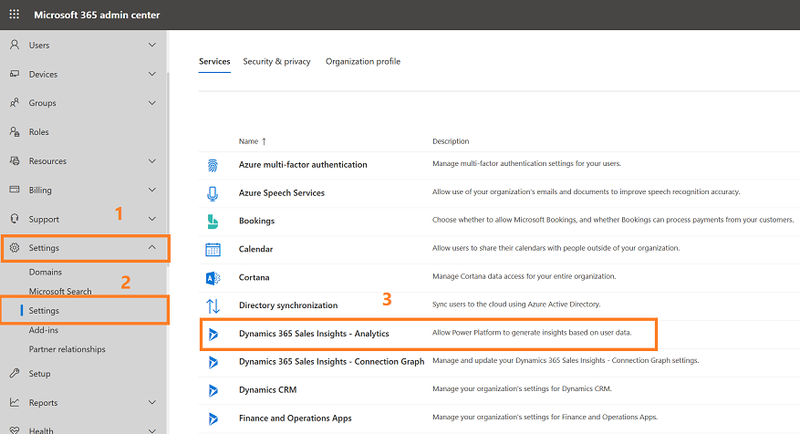 Read the description and configure the Dynamics 365 AI for Sales – Analytics settings as on and select Save. Now you can connect to exchange server to collect data. 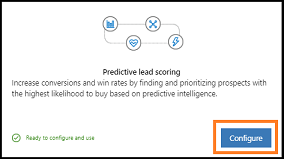 On the Overview tab, select Configuration from Predictive lead scoring section. You can also select Predictive lead scoring tab. Creating a model takes few minutes and you can see progress on the screen. Verify that the Prediction Accuracy score from Model Outcome matches your organizational requirements and select Apply Model. The prediction lead scoring is applied in your organization and users can see the lead scoring in their views under Lead Score column. (Optional) If you are not satisfied with the Prediction Accuracy score, select Retrain Model and apply. We recommend you to train the model once the data is refreshed in our organization for better prediction accuracy scoring. If you want to configure the lead score range, enter minimum value of the range in the Lead Scoring Range. When you change lead score range for a grade, the preceding grade's maximum range value changes automatically depending on the changed minimum grade value. For example, when you change minimum range value score for Grade A to 51, the maximum lead score range for Grade B changes to 50. Save and apply the model. The predictive lead scoring is configured and ready to use in your organization. On the Overview tab, select Configuration from Predictive opportunity scoring section. You can also select Predictive opportunity scoring tab. The prediction opportunity scoring is applied in your organization and users can see the opportunity scoring in their views under Opportunity Score column. If you want to configure the opportunity score range, enter minimum value of the range in the Opportunity Scoring Range. When you change opportunity score range for a grade, the preceding grade's maximum range value changes automatically depending on the changed minimum grade value. For example, when you change minimum range value score for Grade A to 70, the maximum opportunity score range for Grade B changes to 69. The predictive opportunity scoring is configured and ready to use in your organization. 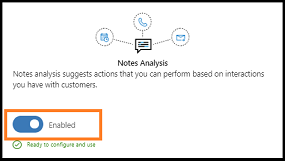 To help users with intelligent auto suggestions when they enter notes regarding a recent meeting or discussion with customer in Dynamics 365 for Sales, enable Notes analysis. After you enable Dynamics 365 AI for Sales features, select the toggle button to enable Notes analysis. Talking points feature is available under Connection insights configuration page. This feature help users in your organization to quickly establish communications with customers. On the Overview tab, select Configuration from Connection insights section. You can also select Connection insights tab. On the Talking points section, select Turn on Talking points for your organization. The categories are automatically selected. You can select only the categories that meets your organizational requirements. The Talking points is configured and ready to use in your organization. Who knows whom feature is available under Connection insights configuration page. This feature help users to quickly identify colleagues within their organization who can introduce them to leads or contacts. On the Who knows whom section, select Turn on Who Knows Whom for your organization. Optionally, you can select the Email template according to your organizational requirements. By default, an out-of-the-box email template will be selected. The Who Knows Whom is configured and ready to use in your organization. After you enable the Who knows whom feature in your organization, verify that the connection graph is enabled in the admin center. This allows the Dynamics 365 for Sales to collect the communication and collaboration details of users from exchange server. 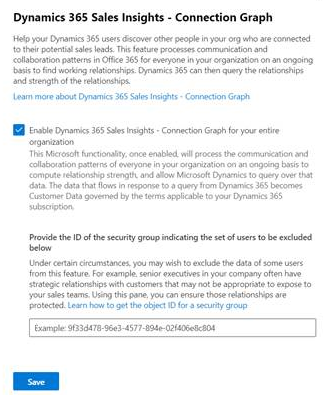 Contact your Office 365 administrator to enable Dynamics 365 AI for Sales connection graph if you do not have sufficient privileges to enable. 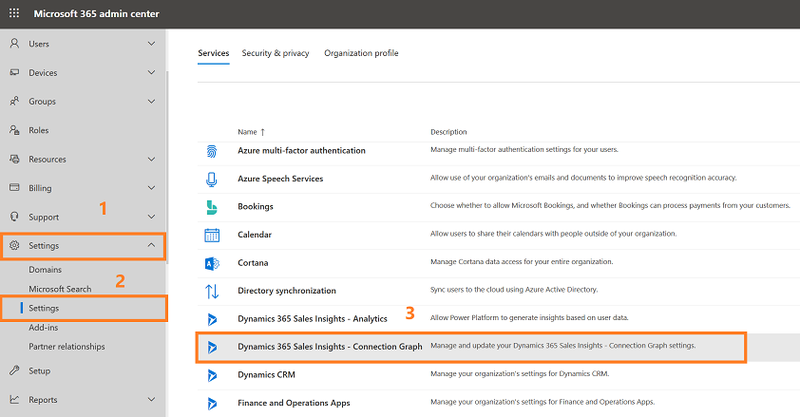 Select Settings > Services & add-ins > Dynamics 365 AI for Sales – Connection Graph. 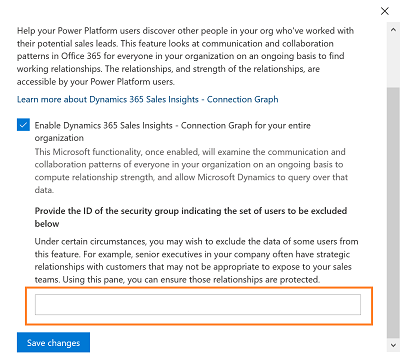 Read the description and configure the Dynamics 365 AI for Sales – Connection Graph settings as on. (Optional) If you do not want to collect information on any group of users in your organization, add the group ID in the text box.